Bag inflation system includes air amplifier with a 4” diameter actuated butterfly valve for maximum fill volume. 3” diameter dust take-off with butterfly valve and nozzle, vents displaced air. Fully adjustable, high output electric densification system settles material for maximum bag stability and fill volume. System includes a remote Allen-Bradley MicroLogix PLC with Allen-Bradley PanelView touch screen operator interface (not pictured). 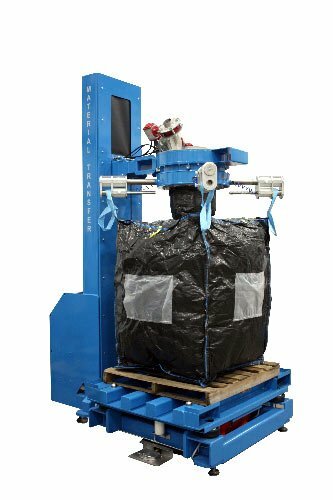 Unit includes a tool-free, forklift removable tote fill head which attaches directly to fill column to switch between filling bags and totes.